Points of Interest: The Frog Leg Festival, an annual event in January. Florida-s oldest and longest continuous seafood festival. Merged with Eau Gallie in 1969 Points of Interest: Florida Tech Botanical Gardens, King Center for the Performing Arts, Liberty Bell Memorial Museum, Museum of Arts and Science, Brevard Community College south campus, Melbourne Square mall. Points of Interest: Ryckman House, Sea Turtle Preservation Society, Flutie Athletic Complex, Spessard Holland Park. Points of Interest: Kennedy Space Center and the Visitor Complex, Merritt Island National Wildlife Refuge, Merritt Square mall. Points of Interest: Barefoot Bay modular home development, founded in 1970, occupies 1,100 acres. Points of Interest: Harry T. Moore Memorial Park, honoring civil rights leaders Harry T. and Harriette V. Moore, who were killed by a bomb explosion at their house on Christmas night 1951. 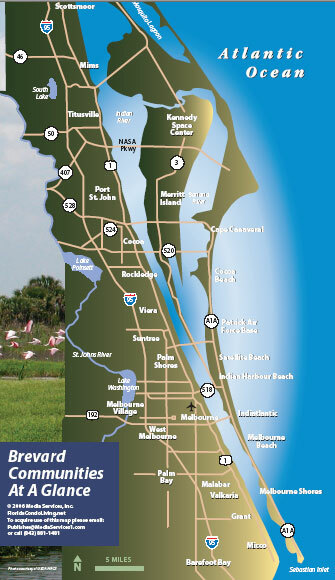 Points of Interest: Brevard Community College campus, New Urban District Park, Turkey Creek Wildlife Sanctuary.